This CD was the first publication of the "Unbekannter Brahms" project. Annemarie Åström and I performed the F.A.E. Sonata by Robert Schumann, Johannes Brahms and Albert Dietrich and the both sonatas Op. 120 for clarinet and piano, as versions for violin and piano by the composer. All these works are seldom heard and recorded. Moreover, thanks to the Brahms Museum in Mürzzuschlag, Austria, we were allowed to record with the so-called Brahms Grand Piano of the museum. Brahms played with this instrument in several concerts. The CD was published by a German CD company NCA Records. Robert and Clara Schumann encouraged and inspired many music students. Their musical protégés included the composers in their 20’s, Albert Dietrich, Joseph Joachim and Johannes Brahms. The friendly relations with Schumann influenced greatly their musical thinking. Schumann, Dietrich and Brahms dedicated their composite work, so called F.A.E. Sonata, to Joseph Joachim who was one of the greatest violin virtuosos of his time. The tone-letter motto “FAE” is used in all other movements except in the Scherzo contributed by Brahms. The motto was an abbreviation of the life maxim of Joseph Joachim, who was then still unmarried: Frei, aber einsam, free but lonely. 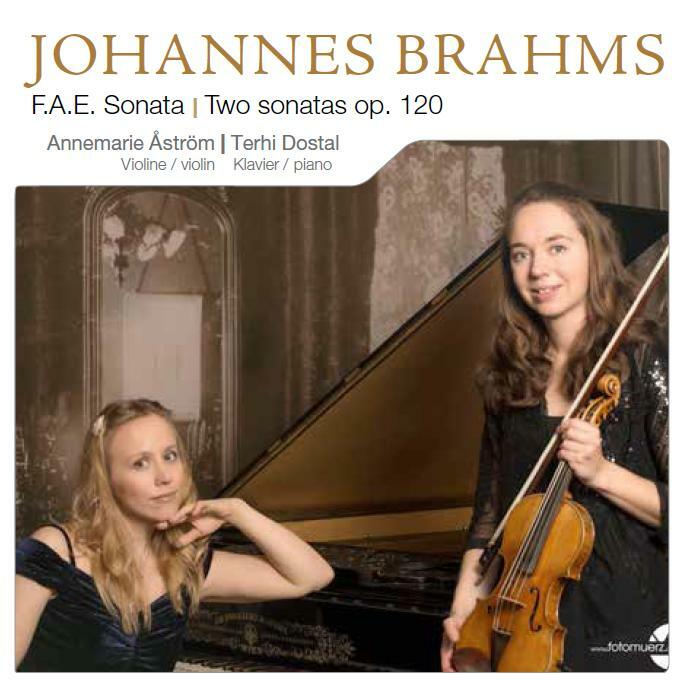 Brahms’s arrangement for violin and piano of the sonatas Op. 120 replenishes the series of Brahms’s violin sonatas (Op. 78, Op. 100, Op. 108) with two later masterpieces. Brahms showed much interest in the careful transcription work: compared to the viola versions, there are much more fascinating changes by the great composer’s own hand. Brahms appreciated the value of the violin versions much and played them e.g. together with the violinist Marie Soldat, using the same Streicher grand piano, which was also in use in this recording. The Finnish violinist Annemarie Åström is known both as an active chamber musician and a versatile soloist. She plays repertoire from Baroque to the contemporary music. She studied in Helsinki, Gothenburg, Copenhagen and Cologne and her most important teachers were violinist-conductor John Storgårds, Prof. Tuomas Haapanen, Prof. Milan Vitek, Prof. Mihaela Martin, Prof. Gerhard Schulz and Prof. Kaija Saarikettu. As a postgraduate student of the Sibelius Academy in Helsinki she specializes in the Scandinavian Violin Music from 1826 to 2014. In her Doctor’s Thesis she discusses violin instruction in Finland and Sweden. Her CD Nordic Violin Music was published by Alba Records and became excellent reviews. Annemarie Åström is a founder member of the Finnish Swedish chamber music group “AND” and plays also in “KAAÅS Trio” and in “TrioArTempo”. As a sought-after artist she also performs in many Scandinavian music festivals. Åström worked also as a leader of several orchestras. The career of the Finnish pianist Dr. Terhi Dostal was launched with a performance as a soloist with the Orchestra of the Mariinsky Theatre of St. Petersburg under Valery Gergiev. She has played in several European countries and in the USA. Terhi Dostal has in recent years devoted herself to the interpretation of the music of Johannes Brahms. In her doctoral thesis she discussed the literary predilection of the young Brahms. She performed the complete works of Brahms’ piano compositions in her concert series in Finland, Germany and Austria. Her solo CD "Brahms Variations" was published in 2010. Terhi Dostal is also known as a fine interpreter of Finnish music. In recent years, Terhi Dostal has recorded Finnish music with several broadcasting companies including YLE1, Bayerischer Rundfunk, Deutschlandradio Kultur and Kulturradio RBB. She also undertook the artistic planning of the NordNote concert series in the prestigious Konzerthaus in Berlin 2009-2010. The grand piano was chosen by Johannes Brahms for the Viennese family Fellinger. At home of Dr. Richard and Maria Fellinger Brahms was comfortable in the private circle of friends and played music in many home concerts together with the clarinetist Richard Mühlfeld, the violinist Marie Soldat and other artists. Brahms recorded two small pieces with the Streicher grand piano in 1889. These unique phonographic recordings are the only existing sound documents of Brahms’s piano playing. The last owner of this piano was Dr. Imogen Fellinger, the great-grand-daughter of Dr. Richard and Maria Fellinger. When she died in November 2001, she bequeathed the piano, together with her valuable music library, to the Brahms Museum in Mürzzuschlag (Styria, Austria). After the skilful restoration of the Viennese piano builder Gert Hecher, the grand piano can be heard in the concerts at the Austrian Brahms Museum. At this place therefore heartfelt thanks to the director of the Brahms Museum in Mürzzuschlag, Mr. Ronald Fuchs, for the possibility to use this valuable historical instrument in this recording. The Joseph Filius Andreae Guarneri violin is in possession of the Sibelius-Academy (Helsinki, Finland) and was given as a loan for Annemarie Åström. This violin belonged previously to the favourite violinist of the Finnish composer Jean Sibelius, Prof. Anja Ignatius. To reach the appropriate colour of sound that would match the historical Streicher grand piano, Annemarie Åström plays in this recording with the Pirandello gut strings instead of the modern metal strings. In the end of the 19th century, the gut strings were still used by all violinists. The sound of these strings is somewhat darker, softer and more sensible than the tone of the metal strings commonly used today.